Once more Junco has woken to find that she is changed. She has been forcefully leveled up to Archer status by the hateful, evil, and apparently real goddess Inanna. Range begins two years from where J.A. Huss left us clutching Flight to our hearts. Despite the dangerous missions and life-threatening decisions, the I Am Just Junco series has seemed like smooth sailing. All up until Range, that is. Junco is starting to seriously question her past, present and future. Now that she’s lost so much hope along with loved ones she’s beginning to question who she truly is. The only answers she receives, though, lead her to believe that she’s been betrayed. Within the lies and half-truths readers, like Junco, will question what’s really true and what’s not. Junco really lets loose, reckless and kind of scary! Believing that she’s insane causes her to rebel against Lucan and Tier’s orders. I never stopped to wonder at how heavily this series is influenced by military themes until Junco stops leading or following and starts aimlessly wandering around. With no clear answers about anything going on around Junco, it’s hard to even figure out what’s going on in Junco’s head. The fate of the world is in her and the other six siblings’ hands, but it’s so hard to trust that Junco won’t flip out and ruin everything. Somehow, through all the mistrust and unclear paths this story takes, I loved its unpredictability. It wasn’t straight forward, but Huss kept the plot orderly and as logical as possible for our understanding and enjoyment. 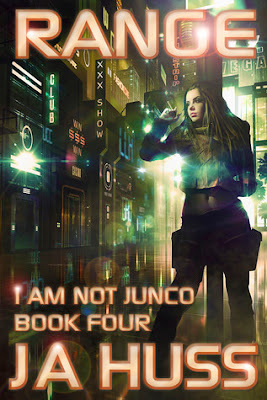 Four novels in and I cannot get enough of Junco! Each novel adds a defining piece of the bigger picture and further dazzle us. Huss is amazing at world-building and I’m amazed at how interesting the I Am Just Junco series continues to become no matter how complex or out of this world it gets!